Now through April 10th, enjoy 20% off Wall Art in ROES and Designer Plus. Create gallery quality Wall Art for your clients and experience your images on your choice of archival mediums. From Vivid Metals and Acrylic Prints to Gallery Wraps, Wood Prints and everything in between, your orders are personally printed by a member of our team and arrive ready-to-hang in as little as 1-2 business days. 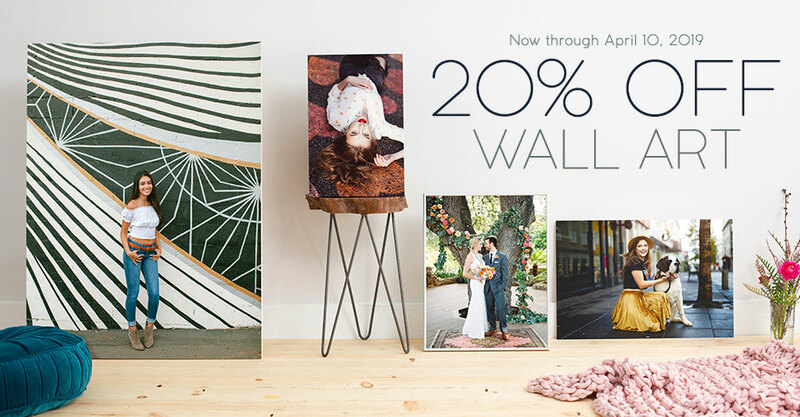 Please note: This discount is valid for 20% off Collagewall Displays, Fine Art Canvas, Fine Art Metals, Fine Art Paper, Wood Prints, Gallery Wraps, Luxe Vivid Metals, Matte Metals, Print Wraps, Standouts, Vivid Metals, Gloss Acrylics, Framing and Matte Acrylics. Prints will not be included in this discount. Additional services like lustre and mounting are not eligible. This offer is available through ROES and Designer Plus. Offer expires at 11:59 p.m. CST on April 10th, 2019. © 2019 Miller's Professional Imaging. All rights reserved.